Welcome! You'll feel relaxed and right at home in this beautiful 2 bedroom, 2 bath, oceanfront condo, which is located in a quiet area on the 8th floor of an 8 story building. The views from the moment you reach the front door are spectacular! You might just think you're on the upper deck of a cruise ship! You'll enjoy the breathtaking ocean views from the living room, master bedroom, or while dining on the balcony. The fully equipped kitchen includes a flat top stove, dishwasher and refrigerator with ice maker. The master suite includes a sliding door to the balcony, and an oceanfront window, walk-in closet, king size bed, triple dresser, desk, TV, and a large bathroom. The guest room includes 2 twin beds, large closet and fresh aquatic decor. The complex includes a beautiful pool, shuffle board, a rec room with a pool table, ping pong table and kitchen area. The location of the Ponce de Leon Towers is fantastic! Besides being just steps from the Atlantic Ocean, it's just 2 doors from Chases beach front restaurant and many other locally owned fabulous restaurants. It's also just minutes from many unique shops with everything from sea shells, resort wear, unique jewelry, pottery, and antiques to one-of-a-kind art. Come, relax, and enjoy the sea breezes! Overlooks the beach and ocean! Location and accommodations were perfect! 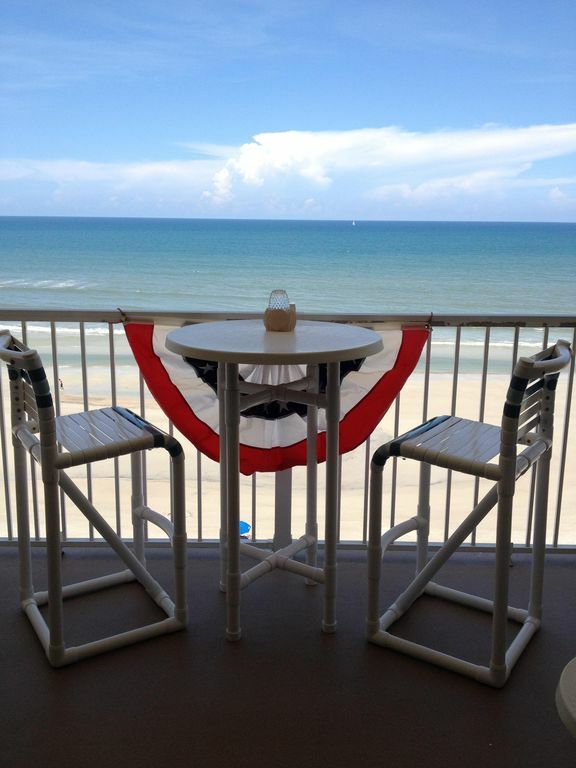 Great view and great vacation condo! Having stayed at the Ponce De Leon since the late 80's (young college student) with my family and cousins, I knew the area like the back of my hand. This 8th floor view and cleanliness of the unit did not disappoint us for our twin 8 year old girls first trip to Florida. Perfect layout for families and the kid's room was decorated appropriately. Owner was great to work with, having emailed back and forth answering all my questions about the unit. When the toaster died during our visit, they had one shipped overnight! Pool is great for all ages and abilities; swim or soak it's up to you. We had lunch frequently around the pool using the tables and umbrellas. Shuffleboard courts are always fun while waiting the required (Mom and Dad's rule) hour after eating before getting back in the pool! And for a break from the sun, there is a pool table and ping pong table. The location is perfect, close enough to a grocery store (7 minutes maybe), restaurants within walking distance, Downtown New Smyrna Beach and all it's shops and restaurants a short drive (by road or by beach!). Great views from the balcony looking down on the beach and ocean. Drive for a little over an hour and you are at the Magic Kingdom or many of the other Orlando based attractions. Thanks for helping me to remember lots a great memories, all while creating new ones with my wife and daughters. My girls already have me finding out when their school break week is so they can return. We stayed in this condo for only three nights and wish it could have been longer. The view was spectacular and the location was great. Restaurants were within walking distance and downtown NSB was very close. The condo was clean and well equipped. We will definitely return in the future. The unit is beautifully appointed and wonderfully maintained. We especially liked the layout which provided privacy for guests while still having a large yet cozy common area. This accurately described listing is comfortable, close to a variety of great restaurants as well as wonderful shopping and the arts. Our favorite menu offering was the Pasta Puttanesca at The Garlic but it was also great to have the grouper at JB's Fish Camp or the tapas at The Spanish River Grill. The beach is so easily accessed where one can walk, fish, hunt for treasures and get plenty of sun. I would never hesitate to recommend this property. The owners keep it ready for guests. They even keep a binder full of resources so that their visitors can find things to do and see while in the area. For January visitors--be sure to take in the Gallery Walk. We had a wonderful time. We were here for July 4th and the Atlantis launch. The view was amaazing and the condo was great. We plan on returning next year and hope to stay here again. I have stayed at this condo a few difference times of the year and have enjoyed it very much. The weather is always great and the condo is decorated so cute. A lot of extra touches in the decorating. Very clean, spacious with plenty of towels, cookware, plates, hangers, etc. Balcony looks right over the beach and ocean. I love to sit out in the morning with my coffee waiting for the sunrise. The pool area is beautiful with really nice landscaping and plenty of lounge chairs. Beach has close easy access, so the biggest decision for your day could be whether to go to the beach or the pool. Restaurants are great in the area and shopping and dining conveniently located. Also only an hour drive to Disney World. I would stay here again! Love, love, love it! Rates are subject to change until reservation is confirmed. Rental manager will provide confirmation package (including rental agreement), and greet you upon arrival to issue a key and any instructions needed for your stay.